A deeper understanding of branding’s role is necessary if B2B companies want to build value and drive growth. Many business leaders still think of branding as consumer-facing and underestimate the power and value that B2B branding has to offer. A McKinsey & Company study revealed that strong B2B brands increasingly outperform weak ones by as much as 20 percent. The same study found that brand plays an important role in the purchase decision of business buyers. Whilst price, product and/or service are still the most highly ranked factors when engaging a supplier, decision-makers still consider the brand to be a primary rather than a marginal consideration when evaluating a supplier’s proposition. In our experience, B2B companies tend to shy away from branding for two reasons. The first is the misconception that brand has no serious purpose or value to B2B companies. The second is more complicated, and it’s related to the varied audiences and often complex buying cycles. Purchases are primarily motivated by logic and reason with multiple levels of stakeholders each with their own agenda. Decisions are made based on facts, statistics and numbers. They are highly value-driven, controlled by budgets, consultative relationships and long-term investments. 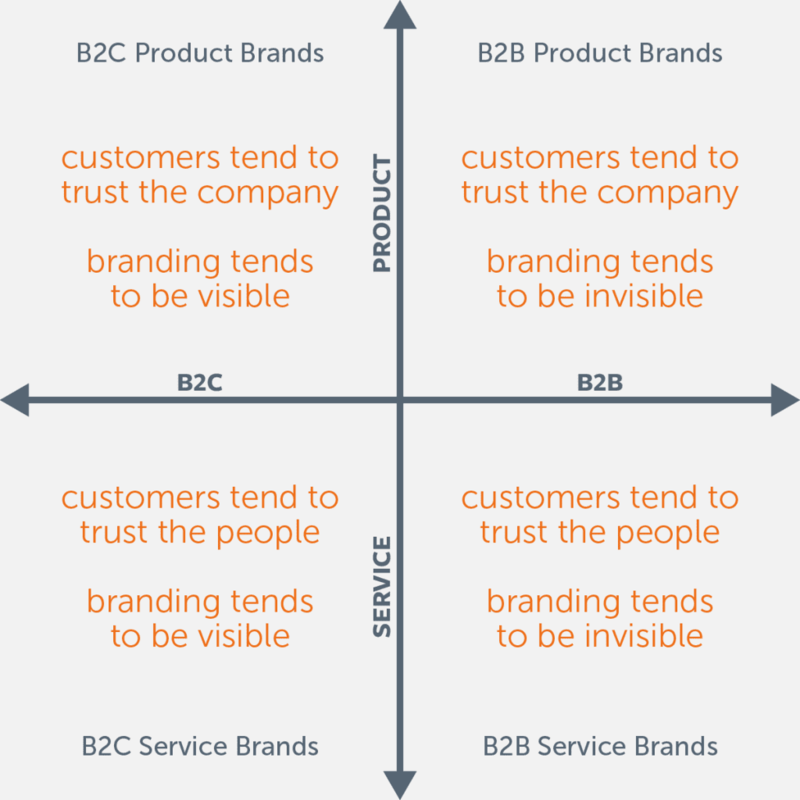 Marty Neumeier created a useful diagram to explain the critical differences between different types of companies when it comes to branding—from the most visible (B2Cs selling products) to the most elusive (B2Bs selling services). Ultimately the degree to which a customer trusts a company or their staff determines whether he or she engages them or a competitor. It’s important that B2B brands win the hearts and minds of their employees and customers. 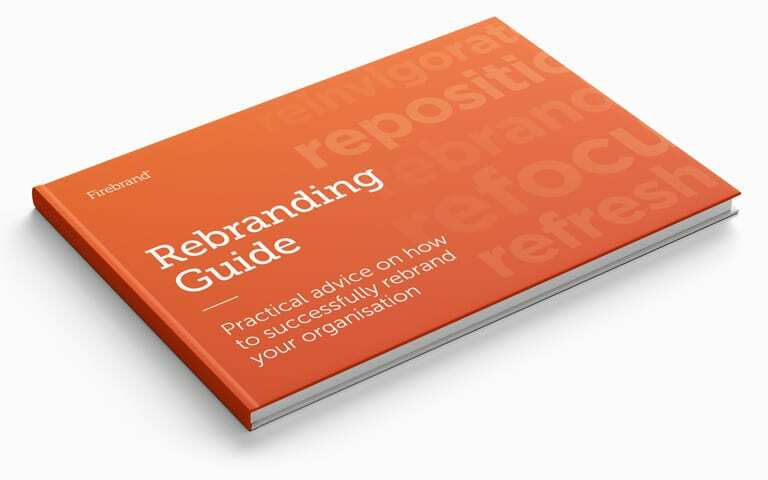 Think of B2B branding as a ‘promise delivered’ both internally and externally. An authentic inside out brand is built on a shared vision and brought to life with the help of your organisation’s greatest asset—it’s people. Brands need PURPOSE to survive. Purpose-driven brands bring clarity and help organisations drive actionable growth. Purpose provides a compass for all stakeholders to move in the same direction, all working together to turn the vision into action. A strong and well-articulated brand purpose is something that energises and inspires your employees. It’s something that resonates with them on a deeper level, something they can grasp intuitively and bring to life without the need for guidelines and explanations. Empowering your staff in this way transforms them into your greatest brand ambassadors and means they will deliver on your brand promise. Brand leadership plays a critical role as the visionary behind a B2B brand. It’s important that brand leaders define and embody a brand and provide direction and motivation to employees. Leaders with vision are aspirational; they stretch the imagination and they look to the future. Employee engagement is fundamental to creating a successful B2B brand. Your brand is the sum total of everything your employees do and say, they are the ones who walk and talk it, nurturing strong customer relationships and creating unforgettable customer experiences. Rather than seeing employees as audiences, treat them as participants in your brand from the very beginning. Help them understand and believe your purpose beyond profit. B2B companies have been slow to appreciate the untapped value of brand and with more evidence that B2B branding works, the window may be closing on it being a competitive advantage. The sooner your business takes advantage the better.